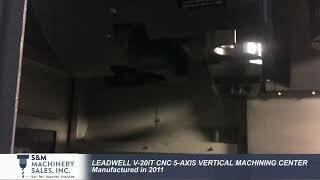 FIDIA KR-214 5-AXIS, Fidia C20 CNC Controls, X=106",Y=44",Z=55", A&B Axis Head 79" x 79" Contouring Rotary Table, 45HP, 24000 RPM, New 2005. Cincinnati 3-spind 5-axis Profiler, Siemens Acramatic 950 CNC, X=744", Y=64", Z=28", A&B Axis +/- 25 Degree, 60 HP, 3600 RPM, New 1991/2017. Cincinnati Milacron 3-Spindle 5-Axis Profiler, Siemens Acramatic 950 CNC, X=1200", Y=104", Z-28", 100 HP Spindles, 10000 RPM, 40" Between Spindles, New 1992.